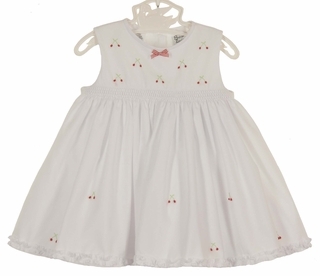 This lovely white cotton blend batiste dress is made by Sarah Louise, a top British designer of beautiful baby garments. The yoke features tiny red cherries embroidered above the smocking. The sleeveless dress has a simple round neckline trimmed with a small red checked bow.The ruffled hem is topped with cherry embroidery. Typical of Sarah Louise design, the dress has a ruffled attached petticoat for added fullness. The perfect take home dress for your newborn girl!